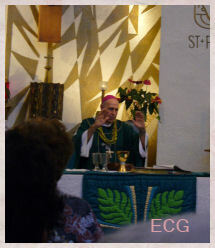 Although I post entries about liturgical abuses, one thing I am trying not to do is to openly criticize any priest. I realize they are human too but since they represent Christ, the Devil does seem to attack them more than usual with temptations to mislead the flock. I am therefore reminding myself by posting the following which is found in the Pieta Prayer booklet. 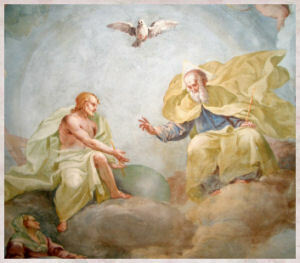 This is Our Lord's revelations to Mutter Vogel. "One should NEVER attack a priest, even when he's in error, rather one should pray and do penance that I'll grant him My grace again. He alone fully represents Me, even when he doesn't live after My example!" "When a Priest falls we should extend him a helping hand through prayer and not through attacks! I Myself will be his judge, no one but I!" 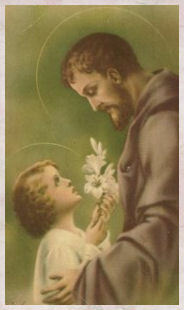 "Whoever voices judgment over a priest has voiced it over me; Child, never let a priest be attacked, take up his defense." 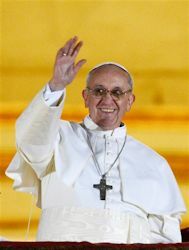 "Never again accept an out-of-the-way word about a Priest, and speak no unkind word (about them) EVEN IF IT WERE TRUE! Every Priest is My Vicar and My heart will be sickened and insulted because of it! If you hear a judgment [against a Priest] pray a HAIL MARY." 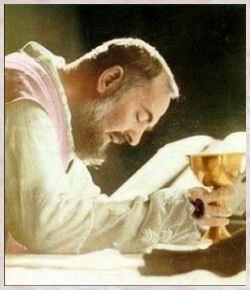 "If you see a Priest who celebrates the Holy Mass unworthily then say nothing about him, rather tell it to Me alone! I stand beside Him on the alter!" 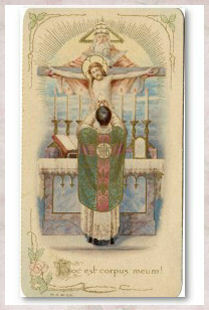 "One ought to pray earnestly, especially at the Ember Seasons, that God will give us good priests. If they are saints, what good they are able to do! But, whatever they are, never speak against them." or should we refer to them as his baditudes. 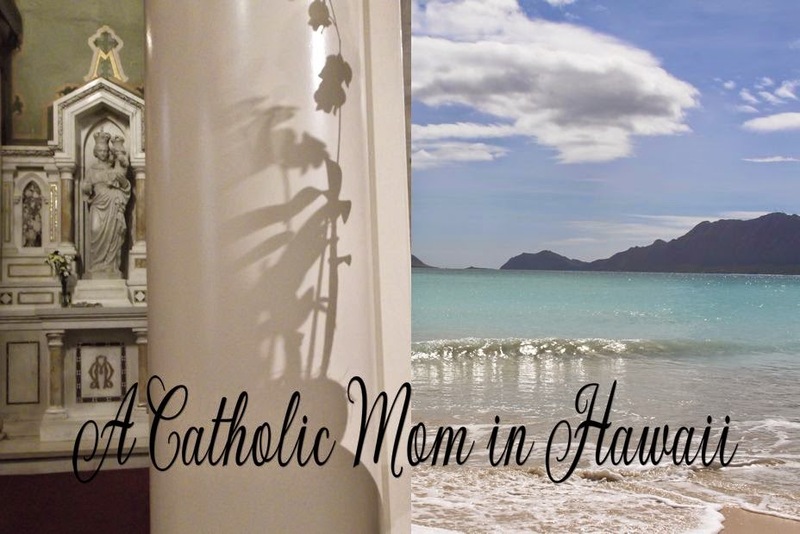 Mahalo to Marcella for sharing these. Blessed are those who are too tired, too busy, too distracted to spend an hour once a week with their fellow Christians in Church -- they are my best workers. Blessed are those Christians who wait to be asked and expect to be thanked -- I can use them. Blessed are the touchy, with a bit of luck they may stop going to church -- they are my missionaries. Blessed are those who are very religious but get on everyone's nerves -- they are mine forever. Blessed are the troublemakers -- they shall be called my children. Blessed are those who have no time to pray -- they are easy prey for me. Blessed are the gossiper -- for they are my secret agents. Blessed are those critical of church leadership -- for they shall inherit a place with me in my fate. Blessed are the complainers -- I'm all ears for them. Blessed are you when you read this and think it is about other people and not yourself -- I've got you. Our noisy, rush-around world badly needs silence. We need to kneel silently before the silent Jesus in the Blessed Sacrament. When Jesus was born there was a hush of silence all around. And then there was heard the quiet cooing of a little Baby. And the angel said, "Peace on earth to those who are of good will." In our busy, busy society we need peace of soul - the peace of that first Christmas night. The first thirty years of the life of Jesus are wrapped in silence. Silence is more profound than words, especially idle chatter. During His fake trial, Jesus stood silent. As the prophet said, "Like a sheep led away to the slaughterhouse, a lamb that stands dumb while it is shorn, no word from him." In the Eucharist Jesus remains with us in silence. The noise, confusion, and endless running around in our society are pulling many people apart. We need silence so that we can pray. The grain in the fieldl grows in silence. Why did Jesus live in silence most of His life? In order to pray, Jesus now awaits us to come to Him in church where He remains with us in the tabernacle. Jesus our Lord and Savior remains with us in silence, so we can visit Him and receive His blessing. Hat tip to Michael for posting this. Figures, I would have to miss daily mass today. Today I found out that St. Charbel was from Lebanon. 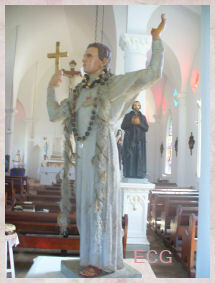 How appropriate that his feast day falls during the fighting going in that country. penance and asceticism, to liberate the soul in its ascent to God..."
that we ask, if it be your will. 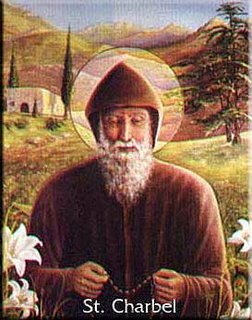 Today is the feast of Saint Charbel... a saint from Lebanon. Let us pray for his intercession in these very hard times for the people of Lebanon and Israel. Remember, O most loving Heart of Jesus, that they for whom I pray are those for whom You prayed so earnestly the night before Your death. These are they to whom You look to continue with You in Your sorrows when others forsake You, who share Your griefs and have inherited your persecutions, according to Your word: That the servant is not greater than his Lord. 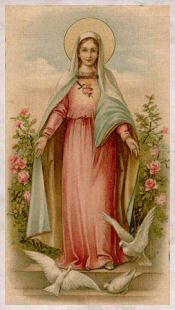 Remember, O Heart of Jesus, that they are the objects of the world's hatred and Satan's deadliest snares. 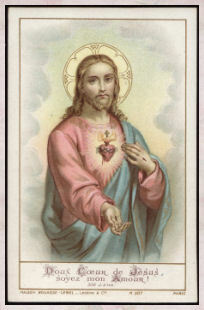 Keep them then, O Jesus, in the safe citadel of Your Sacred Heart and there let them be sanctified in truth. May they be one with you and one among themselves, and grant that multitudes may be brought through their word to believe in You and love You. Amen. Today my son and I were discussing whether or not God blesses people who don't believe in Him. He made the observation that there are people with lots of money and other material wealth that are not practicing their faith or have any faith at all, yet they seem happy. That let to a discussion on why some people who love God so much, also suffer so much. Well, I found the following in my files. It was originally shared by Sue. Suffering, like fire-tried gold, transforms us into the Heart of Christ. God never intended nor wanted man to suffer. Man fell through disobedience from the paradise God created. Christ's sufferings on the cross give our sufferings value, purpose, and meaning until the day when paradise is restored. 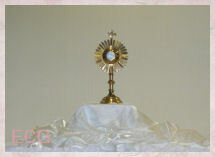 We unite our sufferings now, no matter how great or small, to Jesus truly present before us in the Blessed Sacrament. He takes them and offers them to His Heavenly Father in union with those He suffered for us on Calvary. He purifies them with His Blood and gives them unspeakable beauty by offering them with the love with which He endured His Passion. God uses sufferings for three purposes. One is to purify us from self-love, ego, and pride so that our disposition may always be that of the psalmist: "I bind myself to do Your Will." The freedom of heart is given when we "run the way" of God's Holy Will. Otherwise we are enslaved by our own selfishness. Just before he died, Bishop Sheen was asked by a television reporter what the difference was between the young Father Fulton Sheen, just ordained, and the eighty-year-old Bishop with whom he was talking. The answer was "wisdom acquired through suffering." The second purpose of suffering is that it creates a compassionate heart. Through suffering, one becomes sensitive to the cries and needs of others. The third purpose is that it has a redemptive value when we accept it and offer it to God in union with the Passion of our Lord. The Will of God is that all His children be saved. For this end, He allows human suffering in order that one man may merit necessary graces for another who otherwise would be lost. Like St. Paul, through our suffering we make up for what is wanting in the Mystical Body of Christ. The word that revives us is the Person of Christ, the Incarnate Word of God, continuing His saving mysteries in the Blessed Sacrament. 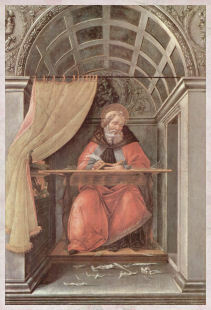 The threefold purpose of suffering therefore is: purification of self, creates a compassionate heart and is redemptive in that it causes propitiation for sins in union with Christ's passion and thereby enables another soul to gain the graces necessary for salvation - purification, compassion, salvation. Keep me from the way of error and teach me Your law. I have chosen the way of truth with Your decrees before me. I bind myself to do Your Will; Lord, do not disappoint me. I will run the way of Your commands; You give freedom to my heart. My soul lies in the dust; by Your word revive me. 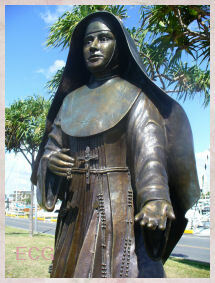 I declared my ways and You answered me; teach me Your statues. Make me grasp the way of Your precepts and I will muse on Your wonders. My soul pines away with grief; by Your word raise me up.